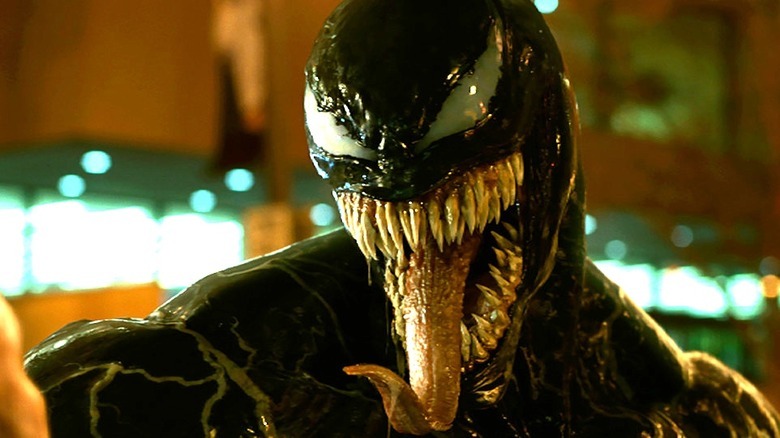 Venom made a huge splash at the box office, taking in more than $205 million around the world during a record-setting opening weekend despite largely negative reviews. Most intriguingly, the character pulled it off entirely on his own, not relying on any backup from a wider cinematic universe. Much was made of a potential appearance by Tom Holland's Spider-Man during the lead-up to the release of Venom. "Will he? Won't he?" The question was in the air, but now that the movie is actually out, we know for a fact that he didn't. So what gives? For fans who grew up seeing Venom in comic books and cartoons, the absence of his rival still feels a little strange. The lack of Spider-Man involves more than just the lack of a cameo appearance — Venom's entire origin story and costume was changed to exclude all influences from the character. But why? Isn't this just another Marvel movie? Well, the answer's more complicated. If you want to know the real reason why Spider-Man's not in the Venom movie, we've got to talk business. Marvel movies didn't really become "Marvel movies" until 2008's Iron Man, and even then, it took a few years for audiences to catch on. Now, we live in a world where Marvel's Cinematic Universe is reigning royalty of the box office, a seemingly bulletproof assembly line producing hit after hit. It wasn't always this way. In the 1990s, Marvel Studios (then Marvel Films) was still in the process of trying to convince Hollywood that movies based on comic book properties might possibly be a thing worth pursuing. Originally, Marvel had no leverage in the movie business, and farmed its properties out to anyone who would take a chance on using them. This is how Fox ended up making the X-Men and Fantastic Four movies, how Universal ended up in charge of the Hulk, and why Spider-Man and his many friends and foes ended up in the hands of Sony. Incidentally, Sony briefly had a chance to take ownership of many, many more Marvel characters; under the impression that audiences would only care about Spider-Man, the people in charge of the decision refused. Oops. This is how things used to be. Marvel Studios has since been acquired by Disney, which more recently also acquired Fox, bringing a large chunk of the Marvel characters back under one roof — except for Sony's stable. The same year Marvel Studios took its burgeoning cinematic universe to the next level with revolutionary team-up movie The Avengers, Sony rebooted its own Spider-Man franchise with the The Amazing Spider-Man, starring Andrew Garfield as the titular webslinger. While the 2012 entry did respectable business at the box office — everyone loves Spider-Man, after all — the wheels fell off of that franchise pretty quickly. In an effort to compete with the increasingly dominant MCU, Sony started laying track for its own cinematic universe set in the world of Spider-Man's New York. Reports emerged that Sony was developing a movie based on the villain team the Sinister Six, with the villains being clumsily seeded in the overstuffed Amazing Spider-Man sequel. There were also rumors of a potential Venom spinoff, as well as a prequel movie focusing on a young Aunt May — a mind-boggling proposition that was heartily made fun of even at the time. 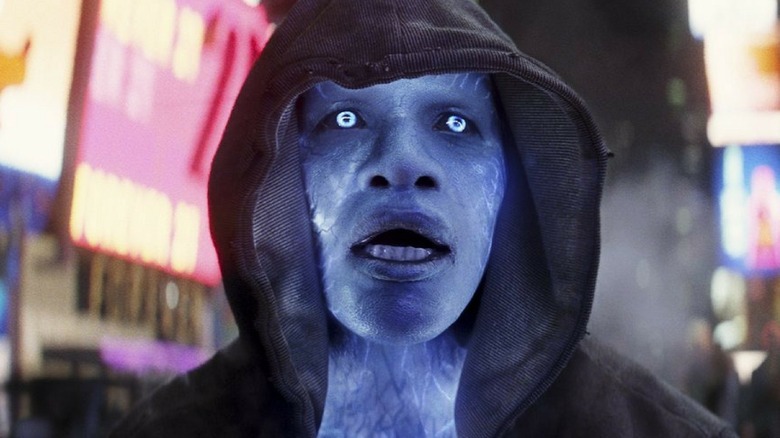 But the series-low reception to The Amazing Spider-Man 2, both critically and commercially, put the kibosh on those plans, leading Sony to re-evaluate its entire approach to the Spider-Man character on film. In doing so, they leaned into a classic strategy for survival during competitive times — if you can't beat your rivals, you may as well join 'em. By 2014, Sony and Marvel were officially in talks to potentially collaborate on producing a second reboot of Spider-Man movies — talks which culminated in the 2017 release of Spider-Man: Homecoming. The arrangement, a complicated mixture of marketing rights, distribution rights, and divided creative control, sported benefits for both parties. 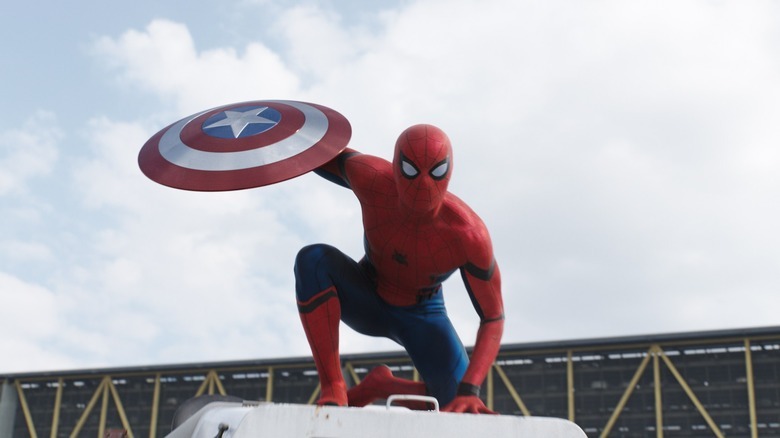 Creatively, the arrangement allowed Marvel Studios to use Spider-Man in its own stories in the MCU, including a high-school-aged version of the character to great effect in Captain America: Civil War, Avengers: Infinity War, and his own solo adventure. On the other side, Sony got to reap some profits off of Marvel's golden touch, teaming up with its rival to revive excitement for the character. According to reports, the deal is fairly open-ended, and has been subject to adjustments in the past. As things stand at the time of this writing, the shared custody deal is for five movies total: the three aforementioned adventures, the fourth Avengers movie, and the upcoming sequel Spider-Man: Far From Home. After that, no one's really sure what's going to happen — either Sony will take back Spider-Man for itself, or the studios will continue to share him. In the meantime, the finer details of who gets to do what with which characters can be kind of confusing. 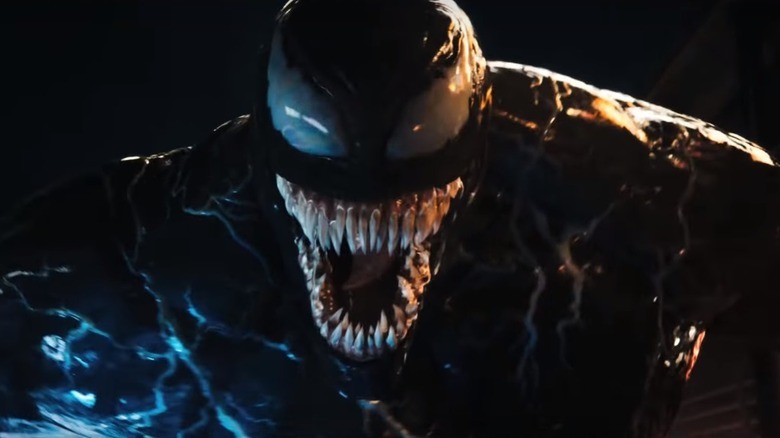 In 2017, Sony also announced its own production of a standalone movie for Venom, one of the more famous Marvel Comics characters that it owns the rights to. The announcement almost immediately sparked confusion about the status of the movie within the canon of the MCU. People wondered: Would Venom take place in the same world as the Iron Man, Black Panther, and Guardians of the Galaxy movies? Or would it be doing its own thing? People had their educated guesses, but no one was entirely sure — even the people in charge of making all these movies, who for a time had trouble getting their story straight. Production on Venom got started in the fall of 2017, with Tom Hardy taking on the role of Eddie Brock/Venom and Zombieland director Ruben Fleischer taking charge of the project. 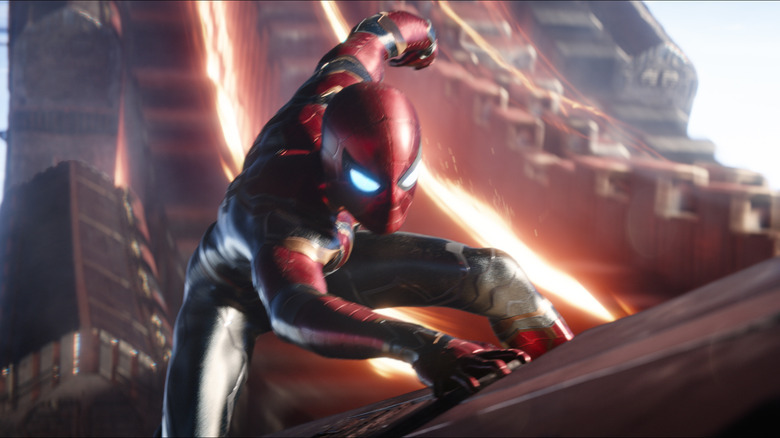 As the movie came together, fans watched as the production took deliberate turns away from Spider-Man and the MCU, seemingly drawing a firm line between the properties within the movie itself. For one thing, the filmmakers deliberately based the Venom movie on a Venom comic book that took the character out of Spider-Man's orbit, moving the action from the webslinger's home of New York City to the San Francisco Bay. 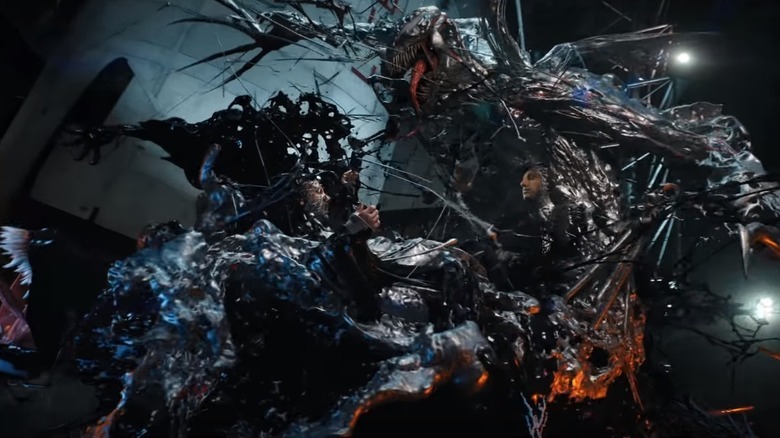 The movie's take on Venom's design also pointedly excised the character's usual white spider motif, replacing the Spider-Man reference with a vague network of white veins. In public appearances, Fleischer and company all emphasized that Spider-Man wouldn't be appearing in the Venom movie, though they pointedly left the door open for a potential crossover somewhere down the line. Whether that would ever actually happen is far from a certainty — that's just the sort of company line attitude you'd expect to hear from a group not willing to slam doors shut for no reason. "Never say never," and all that. Once it was settled that Venom and the other Sony-produced Marvel movies would be separate from the MCU, that should have been the end of the debate. But despite repeated assurances that Spider-Man wouldn't be making an appearance, plus all of the in-story evidence like the altered Venom suit, rumors still persisted that some sort of big Spider-Man reference could happen in the movie. 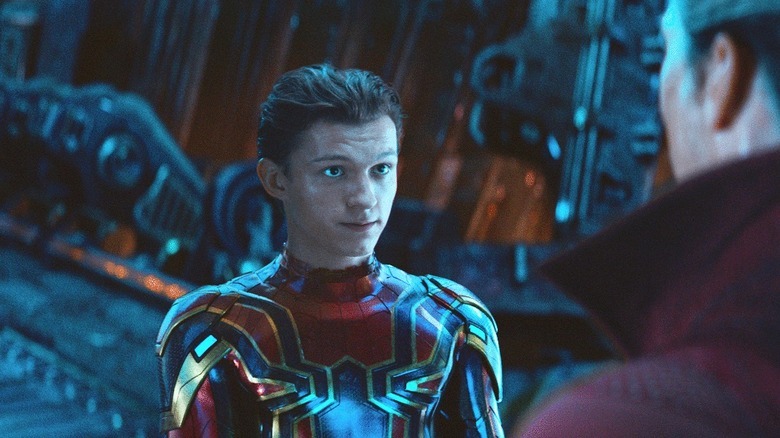 One of the more persuasive rumors, most prominently pushed by Collider's Jon Schnepp, claimed that Tom Holland would in fact be appearing in Venom — just as Peter Parker, and not suited up as Spider-Man. The rumor had a certain kind of logic to it. Taken at face value, a Peter Parker appearance would mean that all those denials of a Spider-Man appearance would technically be truthful. Maybe he would appear in a post-credits sequence, doing some kind of a journalism thing with Tom Hardy's Eddie Brock. Maybe he'd be in San Francisco on summer vacation. It could happen, right? Crazier things have occurred in this silly little genre, after all. All of the cross-chatter made it difficult to be 100% sure, going into Venom's release, that Tom Holland hadn't been somehow sneaked into the cast. It can be argued that Sony benefited from the confusion, with fans of Marvel movies left slightly uncertain what the movie's status in the series was, possibly believing that they had to see it in order to stay caught up on all the happenings in the MCU. Of course, as we all now know, neither Spider-Man, Peter Parker, nor Tom Holland is anywhere near the finished Venom movie, firmly sealing the film in as the separate start of something new. Just as they once tried to do with The Amazing Spider-Man, Sony plans to use Venom as a springboard for its own cinematic universe of superheroes, with its ambitious plans being detailed in an exhaustive Variety report. According to that report and others, Sony is now in development on a number of movies based on its library of Marvel characters, with almost all of the ones we know of being related in the comics to the friendly neighborhood Spider-Man. As Variety notes, Sony has the rights to something in the vicinity of 900 characters from Marvel Comics — and you can be dang sure that the company has talked about making movies for at least 850 of them. The box office success of Venom all but assures that the studio will move forward on a few of these movies, building out a shared universe that it is internally referring to as "Sony's Universe of Marvel Characters" — which is not a great name, but hey, it's what we've got for now. The question is, who's next? Venom's killer opening weekend actually edged out the box office take for the MCU's most recent movie, Ant-Man and the Wasp. Sure, the Ant-Man sequel may be sort of small potatoes for that mega-series, but you can bet the Sony folks spent the weekend's afterglow toasting their good fortune. Buckle up, baby — we've got a bona fide competition going now. 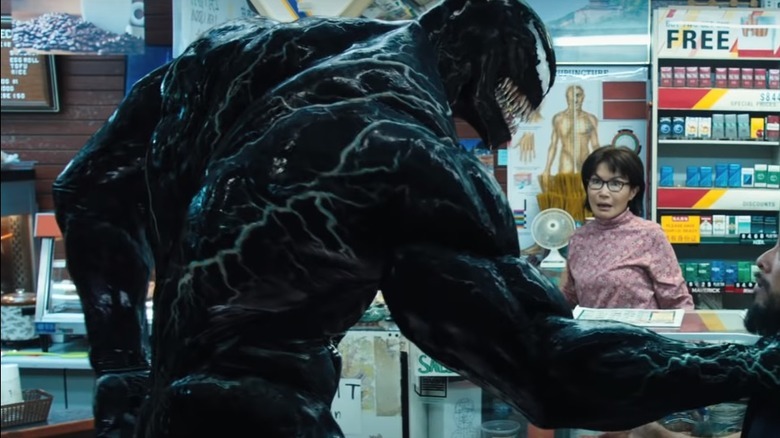 While the post-credits sequence for Venom tees up a pretty obvious sequel of Carnage-based carnage, Venom 2 isn't the only offering you can probably expect from Sony soon. According to Variety's report on the studio's plans, the next movie set to come out of the burgeoning SUMC will be — drumroll please — Morbius, the Living Vampire, starring Jared Leto, the 30 Seconds to Mars frontman also known to audiences for playing Suicide Squad's version of the Joker. So will these movies actually come to fruition? Probably not all of them. But the strong performance of Venom would seem to put the studio in a good position for the future, Spider-Man or no Spider-Man. In the comics that they come from, Peter Parker and Eddie Brock are peers to each other, more or less. Peter, of course, works as a photographer for the Daily Bugle, while Brock is a journalist with rival publication the Daily Globe. One of Brock's major stories is an interview with the villain Sin-Eater, an interview that turns out to be inaccurate when Spider-Man catches the real Sin-Eater while out fighting crime. The reveal costs Brock his job, sending him over the edge into supervillainy after he encounters the Venom symbiote — a symbiote which used to be attached to Peter. Obviously, it's too late now to do this origin story. But would any version of this relationship work in the movies now? 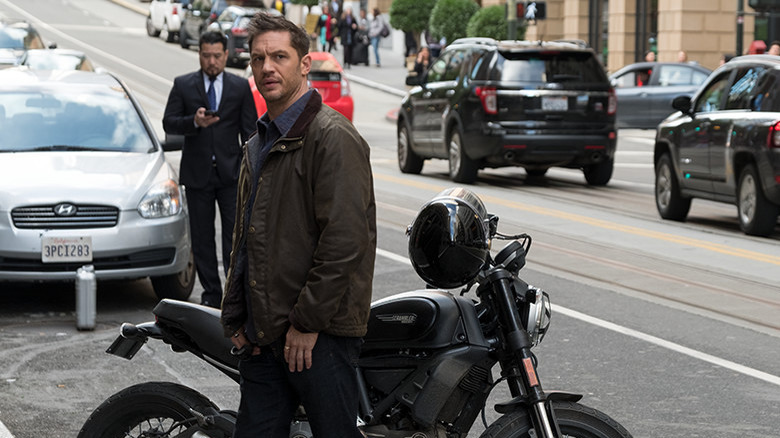 Tom Hardy's Eddie is much older than Tom Holland's teenage Spider-Man, after all, and this Venom seems to love fighting crime just as much as Spider-Man. Whether it's a rivalry or a team-up, we're just not sure how appealing it would be to play these two characters off of each other right now. While the poor reviews for Venom have got to be sort of discouraging, the movie's boffo box office performance seems to prove that there's some potential in a Spider-Man-less Spider-Man universe at Sony. The question is: How long is Spider-Man going to be wrapped up with Marvel Studios? 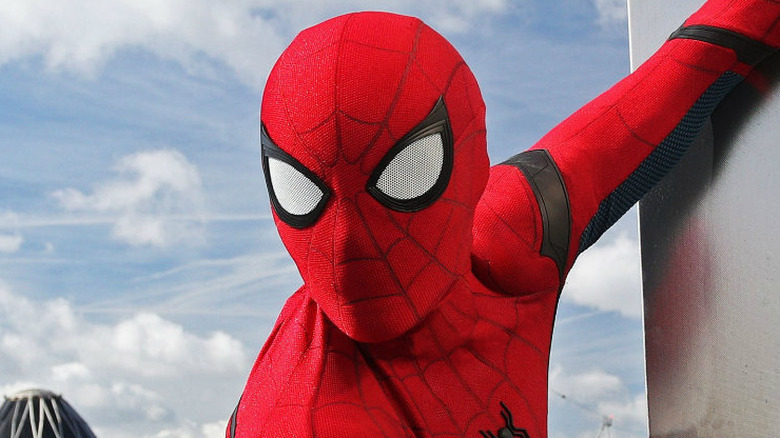 Now that Sony has proven it can make a successful superhero movie again without any help from Marvel on the creative side, it's possible that the studio will get ambitious and reel Spider-Man back into their fold after he makes his fifth MCU appearance in the Homecoming sequel Far From Home. 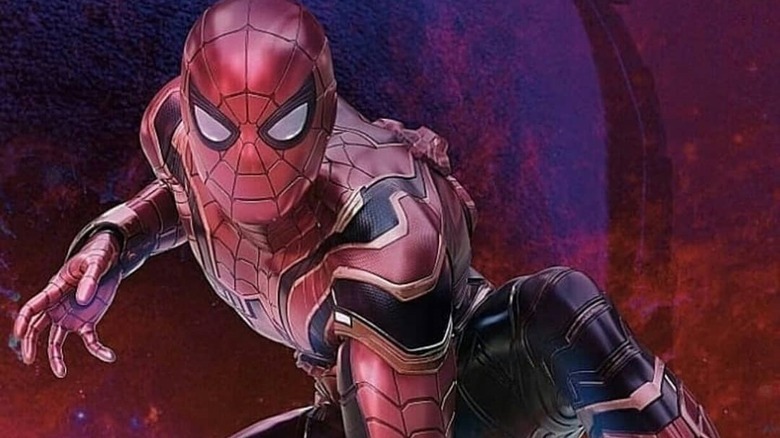 Maybe the studio's creative heads will start figuring that they can handle Spider-Man just as well as anyone else, and they'll reboot the wall-crawler yet again to bring him into their own SUMC. From an outsider's perspective, it's just not possible to predict right now, and either outcome could be a good thing or a bad one, depending on your perspective. As far as pop culture is concerned, Spider-Man's not going anywhere. But as to who will be steering the ship in the future — well, that's a little bit more up in the air.